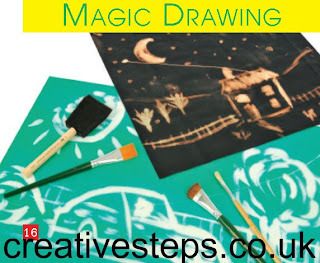 I've said it before, Creative Steps is one of the best children's activity and learning magazines that I've ever seen... and I've got a special peek into the Summer 2012 issue that I get to share with you! Check out these two great activities you can do at home: Homemade Raspberry Ice Cream (no ice cream maker required) and Magic Drawings, read on to see how to make them, then check out Creative Steps for more great projects. 1. Wash the raspberries and dry them on some paper towel. Mash them in a bowl. 2. Sieve the icing sugar into the bowl of raspberries and mix it in. 3. Add the Greek yoghurt to the mixture and stir everything together well. 4. In another bowl whisk the cream until it is thick with stiff peaks. Stir in the raspberry mixture. 5. Spoon the mixture into one or two containers, level it off, put on the lids and put them in the freezer. Get the ice cream out about 10-15 minutes before you want to serve it. Using a scoop dipped into hot water will help! 1. As this activity uses bleach, there MUST be adult supervision at all times and we suggest the children taking part should be at least aged 5+. 2. Put one tablespoon of bleach in a bowl and put the bleach bottle away. Let each child choose a sheet of tissue paper. 3. The children should choose what they would like to 'paint' with and then dip it into the bleach. They should gently paint as they would normally and after a few seconds, the area painted turns the paper a paler colour. This will get more enhanced after being left to dry for a few minutes. Mount on white paper for a greater effect. 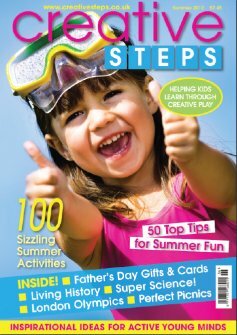 In this issue of Creative Steps, there are 100 different activities for kids (broken down into age ranges from 0-5 Years, 5-7 Years and 7-11 Years) and 50 Top Tips for Summer Fun. 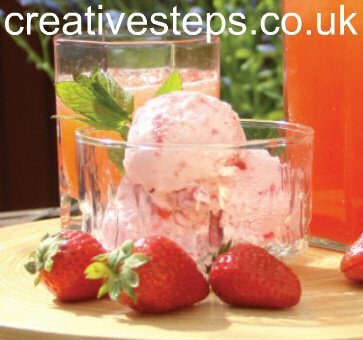 Disclosure: I had a chance to take a peek at the digital online version of the Summer 2012 edition of Creative Steps Magazine, and was given permission to share the above recipe and project with you! People Like Us (in theaters June 29th) explores the amazing journey (based on true events) of hot shot salesman Sam, who, in the span of one day finds his job in jeopardy and finds out that his Dad, whom he has only seen a handful of times over the past years, has died. He travels to his childhood home with his girlfriend and receives a cool welcome from his Mother, played by Michelle Pfeiffer. The next day he is contacted by his father's lawyer, whom he meets with. After this meeting, he finds out that his father wants him to give $150,000 to someone he has never heard of (meet Frankie, who turns out to be his half-sister he had no idea existed), which is really what starts his journey of discovery and growth. The acting was wonderful, as was the heartwarming and very touching story. The last scene of the movie was very sweet and I know there was more than one teary eye in the theater. I saw the movie with a few friends, and we all agreed that the movie was wonderful, but that is was a lot heavier (dramatic) than expected. Still love it and recommend it, but go knowing that not all is light and comedic in this story. My one and only real complaint with the movie is that Sam's legal problems pertaining to his job were not resolved, so that aspect felt a little unfinished to me. *Disclosure: I was invited to see a sneak peek of the movie People Like Us. Our family is starting to spend more and more time outside, and I've recently come to the conclusion that there are some wooden things in and around our yard that need a little TLC... We have one of those wonderful wooden play structures with a climbing wall, slide and swingset that was new a few years ago, and I can't wait to make it look new again. We also have a beautiful new garden pergola and wooden-rimmed garden that also need to be protected from the outdoor elements. I'll need to clean and re-stain the wooden playset, and stain the garden items. This is where Flood® Wood Care will come in handy. They have some wonderful products designed to protect and maintain your wooden decks, fences, siding, outdoor furniture and playsets including wood finish removers, wood cleaners, and stains. A huge bonus of using their website is the ability to use their project planning tool, which will guide you through the steps needed to determine what you need for the project you are undertaking. I tested the project planner for our playset and was amazed at the tips and options available from Flood®. Part of the online planning tool also shows you the nearest stores that cary Flood® products, here in our area, the two largest stores are Home Depot and Walmart. Flood® is a brand that was created by a family of painters in 1841, and they have worked hard whithin the wood specialty to provide us with quality products and personalized care so that we don't have to be the experts and can accomplish the things we want, just like pros, which is why they have become known as "The Wood Care Specialit." Now is the perfect time to check out their Take it Easy Sweepstakes. If you win the sweepstakes, Flood® will provide the labor and supplies to prep and stain your deck and give you $2,000 so you can host a deck party on your newly re-stained deck! What are you waiting for - hurry over and enter the Take it Easy Sweepstakes. *You must be 18 to enter, and entry is easy, only taking a minute or two. Last night, our family got to go see a sneak peek of the Disney/Pixar movie BRAVE in 3D in Seattle. This was the first movie that our youngest (almost 2 1/2) has seen from start to finish IN the theater, and he did GREAT, even through the darker, more scary scenes. 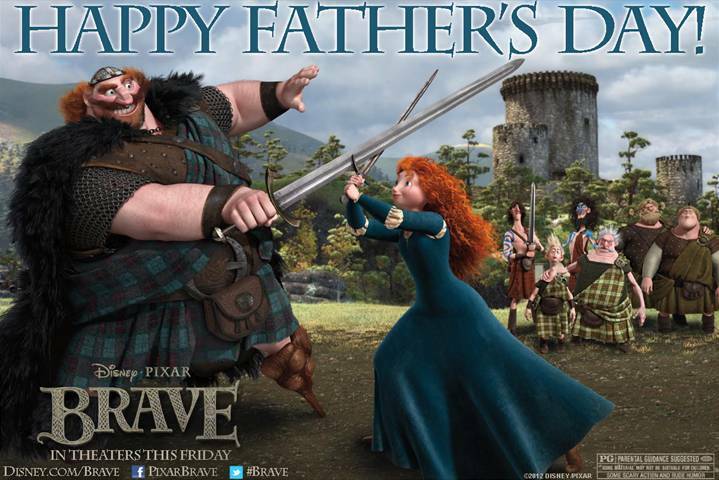 In fact both boys really enjoyed it, and my husband and I shared many smirks and laughs together throughout the film. The details and quality of the film were amazing! There were many scenes where I found myself wanting to reach out and touch something on the screen because it looked so real and textured. The story was fun, even if a little predicable. I will caution parents that there are a few really scary scenes with the bears that may scare younger children... and if you've ever wondered what those highlanders have under their kilts... well, you'll find out with a lot of laughter! Loved the characters, the humor, and the family aspect of the movie. 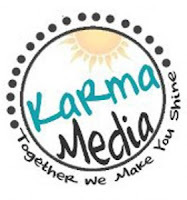 Karma Media has teamed up with Dot.Mine Planners to give 20 readers a planner each. Winners will be given a choice as to which planner they would like from Dot.Mine, day planners that help you find your scheduling bliss! Enter the Rafflecopter below and GOOD LUCK!!! 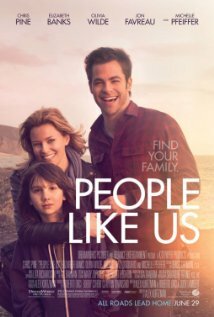 If you are in the Seattle area (or will be visiting) on June 26th, and would like to attend a sneak peak for the upcoming movie People Like Us starring Chris Pine, Elizabeth Banks, Olivia Wilde, Jon Favreau and Michelle Pfeiffer click below and print off a ticket that will allow you and a guest to see the movie for free!! Then I got the opportunity to check out the Dot.Mine Family Time.Mine Planner, which is going to be a huge life-saver for me. This little gem is going to whip me into shape when it comes to time management and will help me ensure that both myself and my family won't miss anything important. There is also a wonderfully large double-page calender for each month. Keep in mind that these pages are about the size of a regular 8 1/2 x 11 sheet of paper, so it is a really nice size to write individual tasks for each family member. 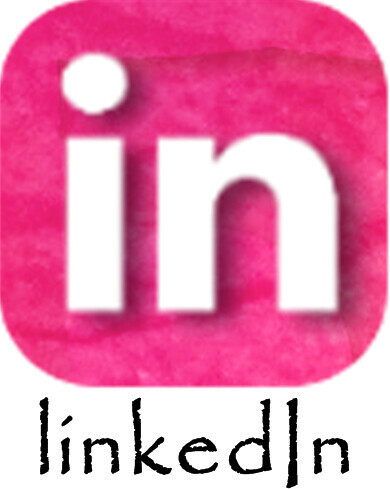 Each month is then followed by a page for each week where you can be even more detailed. 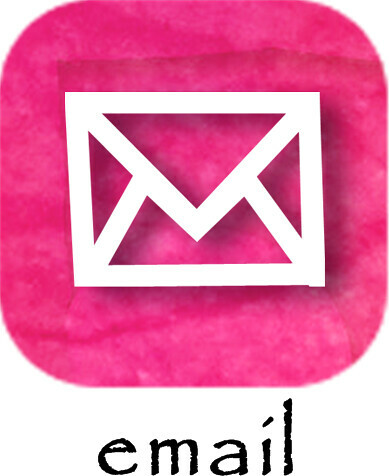 There is also a section to put sticky notes and where you can add notes or make lists. Last but not least is a page showing a small calender for 2012, 2013, and 2014 and a full page of fun stickers to add to your calender pages. Edition Reviewed: The NWGWP Family_Time.Mine - Review copy received in exchange for my honest review in coordination with this Karma Media campaign. Stay tuned and you might win one yourself! Father's Day is the day we pay tribute to all the great Dad's out there, those with us, and those who are with us in our memories. 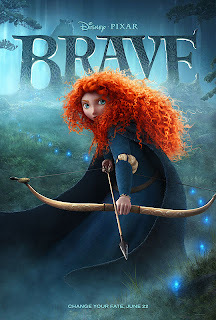 PS - Disney - Pixar's movie BRAVE is out June 22nd! 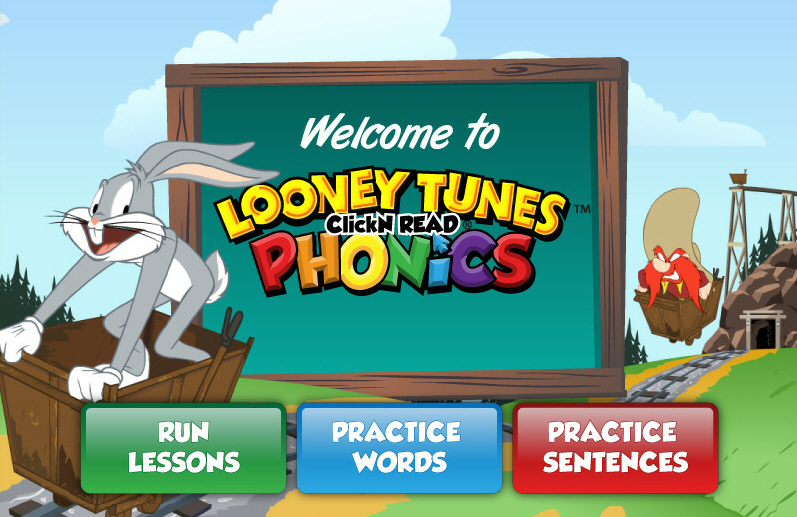 That is one of the reasons why I was so excited to introduce my boys to the Looney Tunes Click N Learn Phonics program. 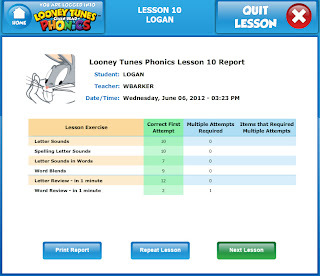 It is available online, so anywhere we go, I'll be able to work on the Phonics Lessons with our son as long as we have access to a computer and the internet. And the best part??? They LOVE the program and consider it a cartoon game. So I am providing my boys with the very same spelling and reading tools that helped me so much. It took only a minute or so to set up my son's account, and he got to choose Bugs Bunny as his Avatar (which is one of his favorite Looney Tunes characters). He immediately wanted to check out what the characters were up to, and he loves that they are helping him learn. 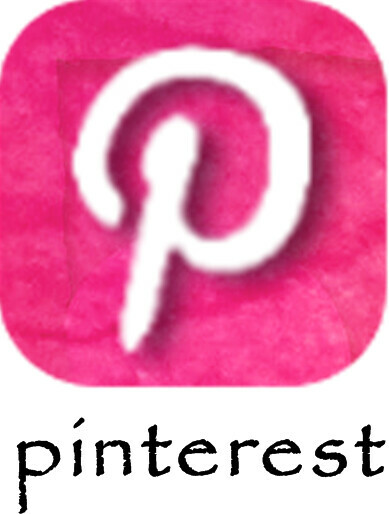 PARENTS - I HIGHLY ENCOURAGE YOU TO CHECK THIS OUT! PHONICS CAN HELP YOUR CHILD THROUGHOUT THEIR ENTIRE LIFE! 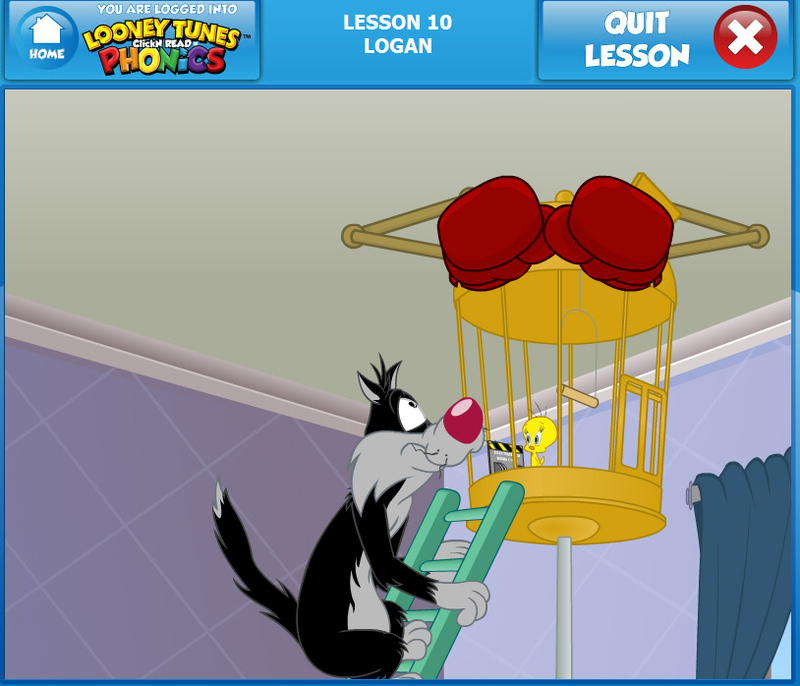 There are 100 lessons, each made up of 4 parts with Looney Tunes short cartoons mixed in. 2. Listening Zone: Kids learn about Phonics Word Blending. They learn to listen to the beginning, middle and end of the word. The robot guide will cover 188 different words, sounding out the different parts, and children will work with 357 individual words. 3. Reading Zone: Kids will learn to read and spell sight words (those that are highly used in daily communication), word families, word endings, Silent-E rule, making sentences, and more. I wanted my 5 year old son to enjoy using this program and he DOES, which is great, but the unexpected benefit of this program and his enjoyment is that our 2 year old is also trying to engage in it along with his older brother, and I'm amazed at how quickly he is catching on to what is happening in the program. 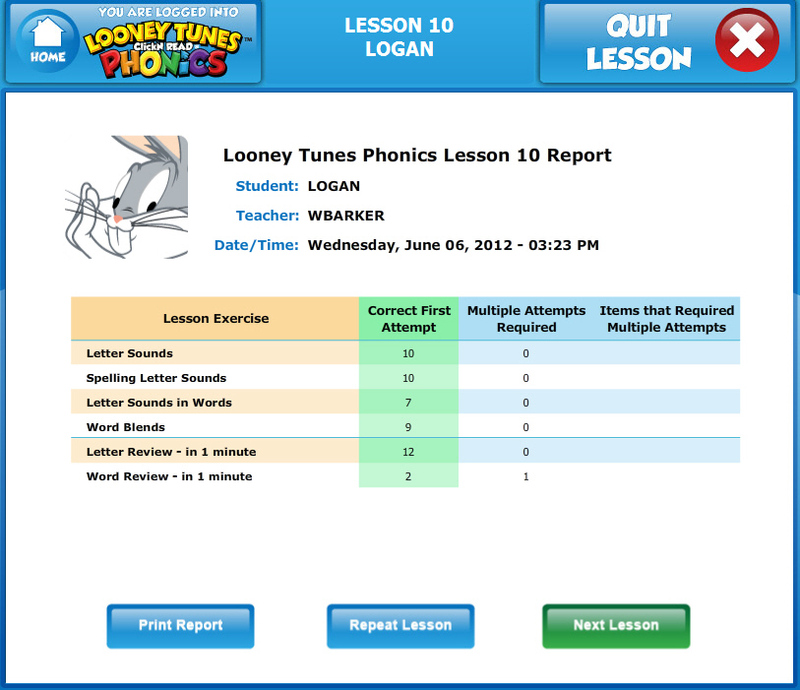 This phonics program is highly customizable, and you get progress reports where you can see exactly how your child is doing. As a parent, I can't emphasize enough how much I approve of Phonics being given as a tool to our children. It enables them and increases their chances of success in school and beyond - I can personally attest to that. 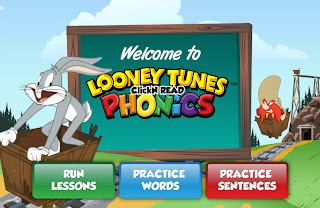 Edition Reviewed: Online Phonics program - I received access to the Looney Tunes Phonics program as part of the Karma Media campaign so I could share the information with you in the form of my honest review! 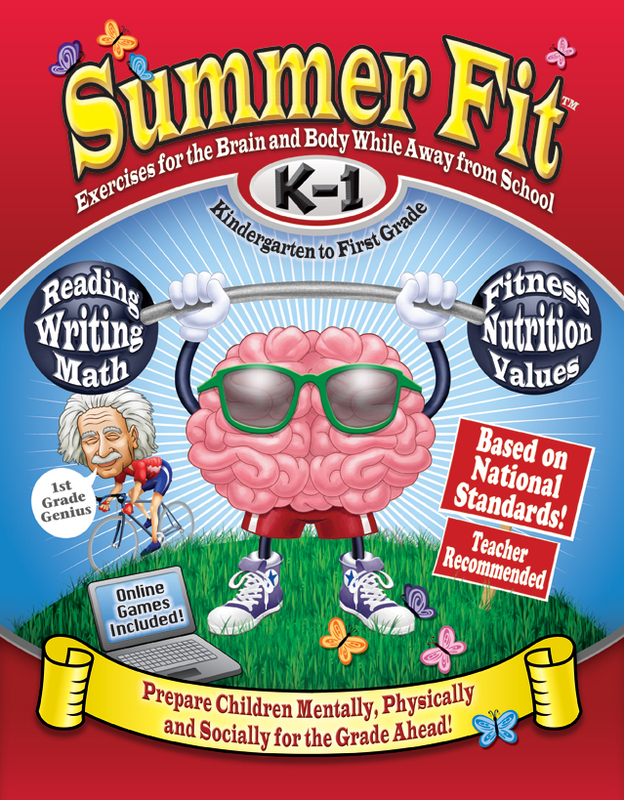 Summer Fit Learning has created a great line of workbooks that you can use throughout summer with your child or children in order to prepare them for the coming school year and keep them physically and mentally active even when they aren't in school. 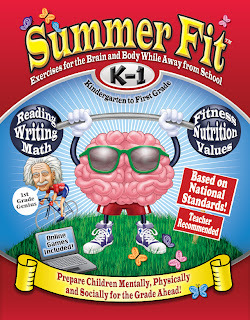 Each book emphasizes physical activity, reading, writing and math skills that are appropriate for each age (Pre-K through 5th Grade). 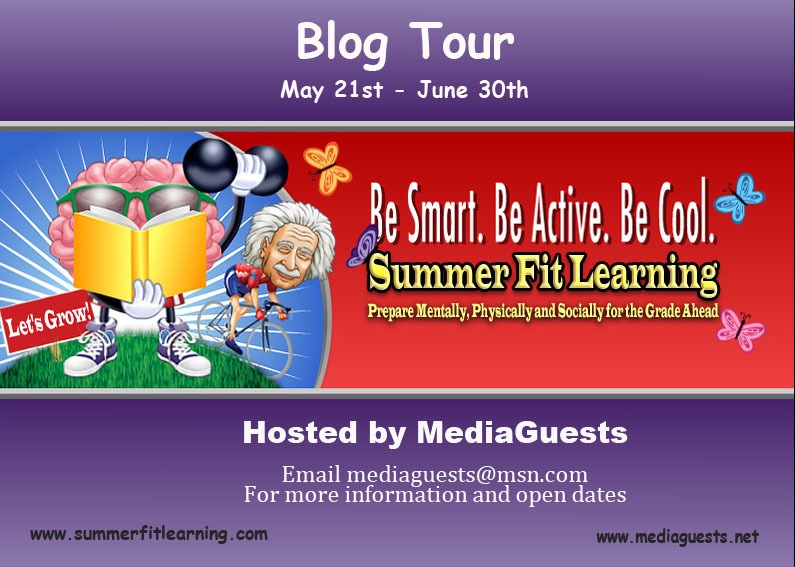 I was really excited to join in the MediaGuests blog tour for the Summer Fit program, and Logan and I chose to try out the K-1 workbook even though he is going into Kindergarten. He has a great grasp of his ABC's, basic writing, and his numbers, so I wanted the chance to give him a few challenges. 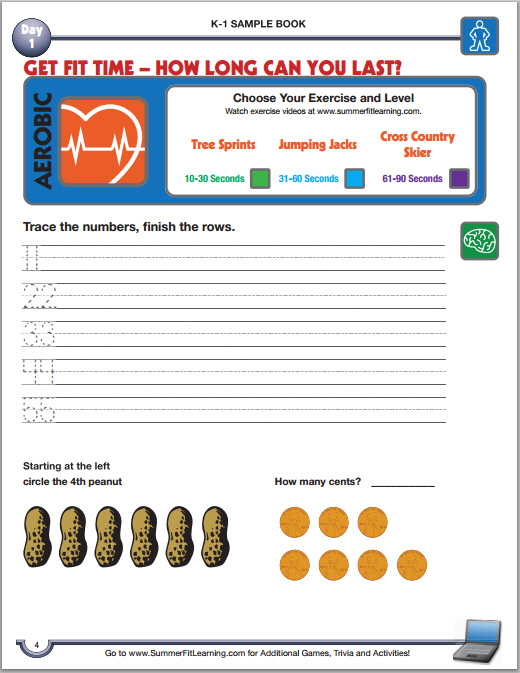 The workbook has a whole section just for parents, providing tips on using the workbook, the importance of fitness and safety, healthy eating and good nutrition, core values and the actual Summer Fit Exercise Program (which includes aerobic, strength and sport exercises). I loved the detailed description of each exercise and activity. 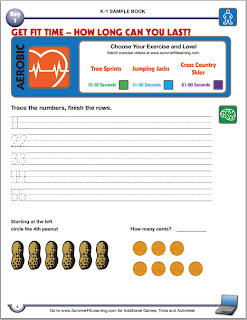 The workbook also provides an area for each section where you can write what the incentive for completing the weekly program (there are 10 weekly programs). Kids get to check off the activities as they do them, and write their values for the day/week. Then there are the actual work-pages, which include tracing and coloring, working with numbers (tracing, counting), working with upper-case and lower-case letters, working with patterns, drawing, shapes, feelings, and other fun activities. The end of the book includes a section for parents with the answers, and a certificate of completion. We have only done the first few days of workbook pages, and the incentive for completing week 1 is a fun outing. So far, his favorite parts of the workbook are the coloring and matching activities. 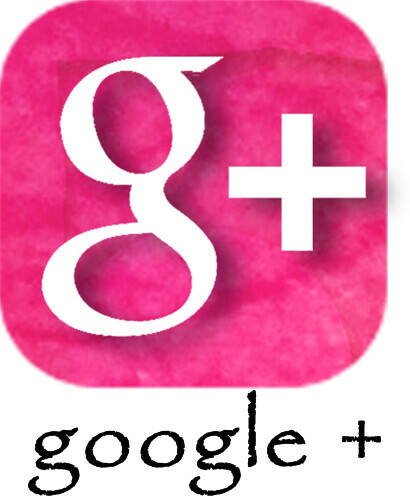 There is a great variety of activities which keeps the learning fun and entertaining. Check out Summer Fit Learning on Facebook - they post great information all the time! If you interact with kids in any capacity, you will want to take note of Rock N Learn's fun music learning videos and cds. 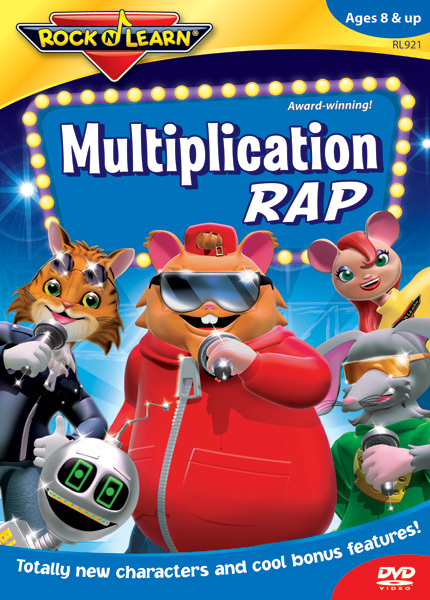 Our family was sent the Rock N Learn Multiplication Rap DVD to check out and it is great. The characters are fun, they emphasize the importance of learning and having fun in school, and the songs and raps are catchy - things that a lot of kids love. They will dance and sing along with the characters on the screen. The kids love this DVD, which is great as a parent, because I know they are having fun AND learning. I can feel great about letting them watch this DVD, and they don't even know that it is "good-for-them." I can't wait to check out other Rock N Learn DVDs. Not only is Rock N Learn Multiplication RAP available on DVD, it can also be purchased as an Audio CD and Book, and now an iBook. 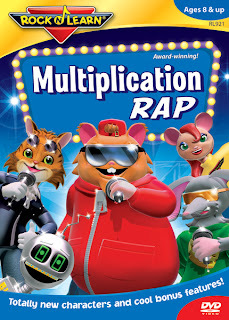 The Multiplication RAP iBook is the first iBook release by Rock N Learn, and it is available on iTunes for $9.99 (you can purchase individual songs as well). Another great thing about these is that they get kids interacting and learning on so many levels by encouraging reading (words are shown on the screen), hearing, and speaking (talk along with the characters). 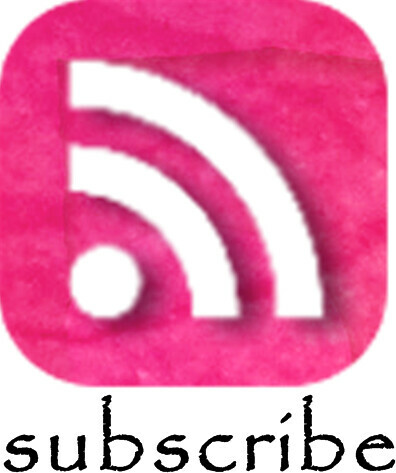 Use coupon code JQ7711 and get 25% off your entire purchase of DVDs and CDs at www.RockNLearn.com (US only). From the first moment I saw water beads at the fair I was entranced. Here were these really neat little tiny "seeds" that were smaller than a seed bead or sesame seed, and when put into water, they grew to the size of marbles! 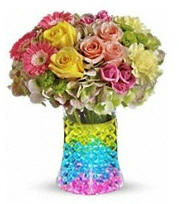 They felt neat and looked really GREAT in a vase with flowers or with an ornamental bamboo shoot growing in them. I could just never bring myself to buy them as they were so expensive. Now I've found a company called Eco-Orbies who creates the same water marble in great colors at a fraction of the cost, and they are eco-friendly and made here in the US. They come in nine different colors: Pink, Coral, Blue, Green, Clear, Purple, Orange, Yellow and Black. You can buy them in a 5 gram package (multiple packages can be used together to create great patterns), and when added to water, they make about 2 cups of water beads. Visitors have enjoyed looking and playing with these little gems. Who said sensory objects were only for toddlers? I think we've had more adults play with these (and found them relaxing) than the kids. Possibly the neatest thing I've discovered with these Eco-Orbies is that you can use a few sprays of your favorite perfume or essential oil to have a gentle and pleasing smell instead of a candle. Each time the water beads shrink, I can add them to water and re-hydrate them and add a new scent. I love this feature! Hydrating the water beads (also called water pearls) is EASY and fun to watch. For each package, put two cups of water in a bowl (I used a large glass measuring cup so the kids could watch as the tiny beads grew), add the beads and let them sit. It should take about six hours to fully grow. When you are done, DON'T throw them out! Let them dry on a cookie sheet and store them for later use. They take up almost no space at all and can be used over and over! Other great uses for these Eco-Orbies: they are safe for beta and gold fish tanks, they can be used with dirt to grow wheat germ and herbs, they can be added to the garden to provide extra nourishing water to the roots, they can be used in vases for flowers instead of marbles, they can be used for event centerpieces, in classrooms for projects or sensory time, use as gifts, use in a pot or glass to add color to a desk or bookshelf, for growing/germinating seeds, and even for growing plants without dirt. 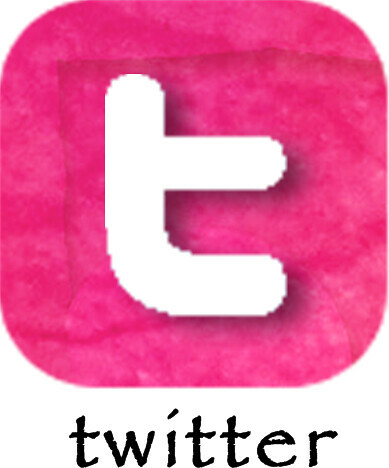 For more great uses, see the Eco-Orbies website. 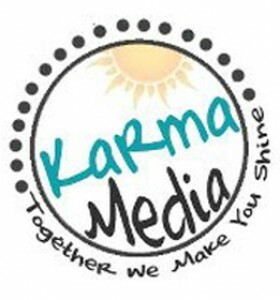 Edition Reviewed: Blue and Magenta Eco-Orbies - I received this product through Karma Media in exchange for my honest review. Want to win some great Eco-Orbies yourself? 10 lucky winners will each win a package of Eco-Orbies! Open to residents of the United States, through June 8th.